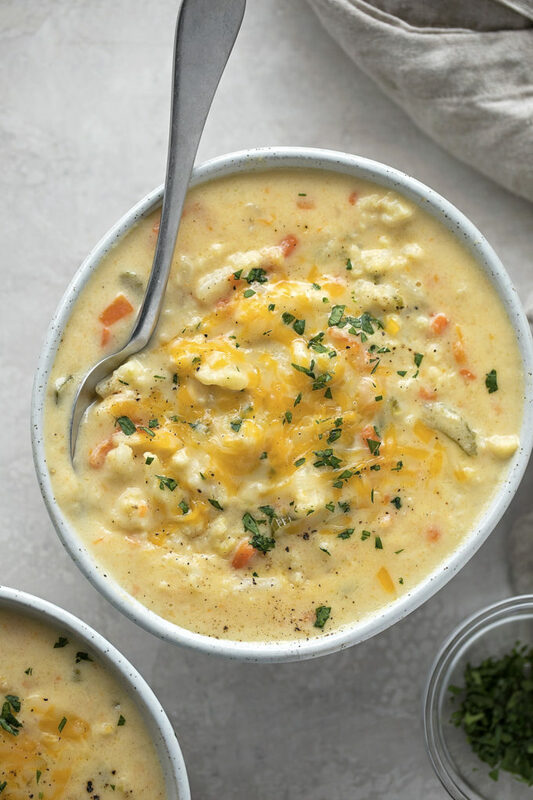 Easy, cheesy cauliflower soup is packed full of veggies and ready to go in just 45 minutes. 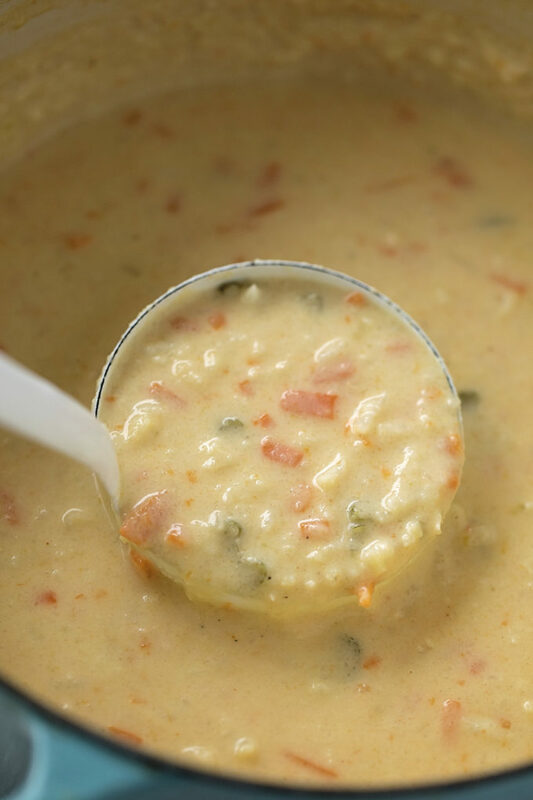 This delicious soup will keep you warm all winter long! 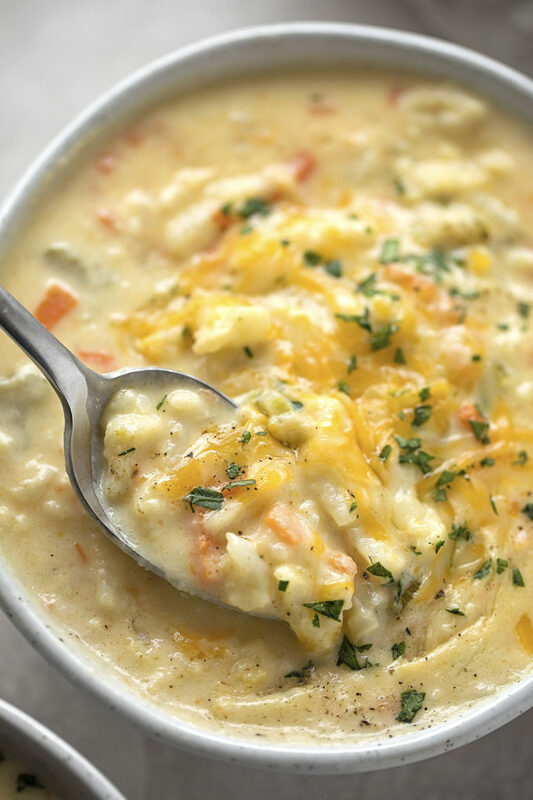 What makes this soup so amazing (aside from the cheese and cream) is its flavor. It’s packed full of flavor!! Celery, shallot, and garlic are the big contributors, with coriander, paprika, and cayenne close behind. It also doesn’t hurt that it’s ready to go in 45 minutes. We can make this when we’re in a hurry or prep it in advance for later in the week. It reheats really well! To make cheesy cauliflower soup you’ll need to grab a BIG head of cauliflower. The biggest you can find. If all you can find are small ones, grab two. The texture of this soup relies on cauliflower puree, so it’s kind of important that there’s enough! You’ll also need two shallots. Why use shallots? Shallots are more sweet and mild than a yellow or white onion (they lack the bite) with a hint of garlic. I prefer to use shallot in creamier dishes where chunks of onion would be off-putting. Making the soup is easy. Saute the veggies in butter, add the flour, whisk in the chicken broth and bring to a simmer. When the broth thickens, add the cauliflower florets, then simmer for 15 minutes. 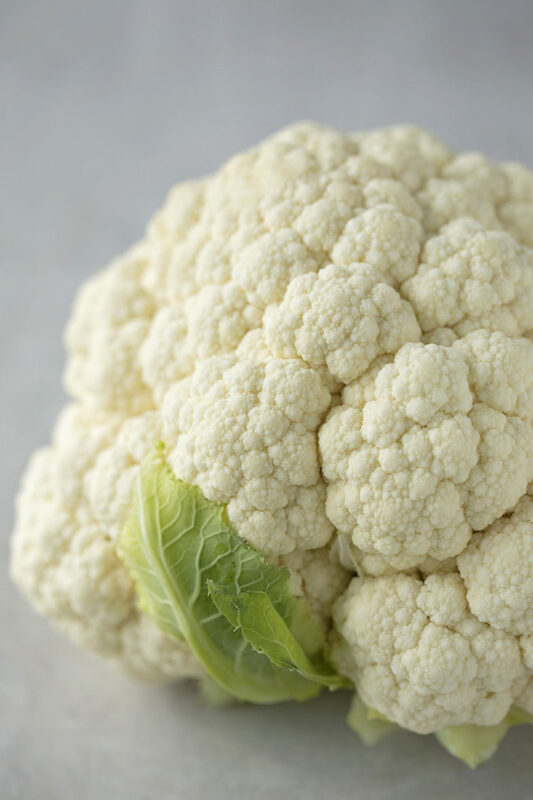 This will cook the cauliflower enough to be able to puree it into a smooth, creamy consistency. I prefer using this method instead of adding extra heavy cream. What can you use to puree the soup? Pour the puree back into the soup, cook for 10 more minutes or until the soup gets nice and thick. Just remember, it will continue to thicken after the cheese is mixed in and after it’s removed from the heat. 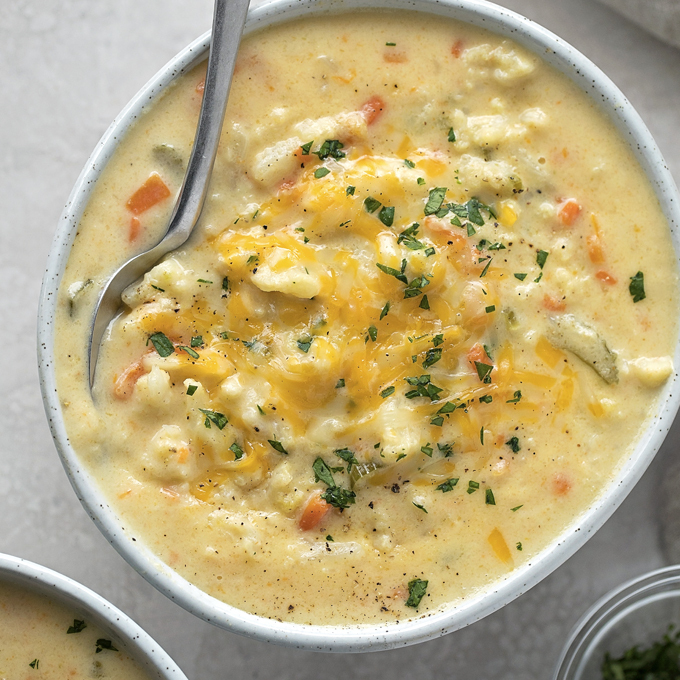 What kind of cheese should you use in cauliflower soup? You can pretty much use whatever you have on hand. I prefer using a soft cheese like cheddar or colby jack. Serve it up with a sprinkle of freshly chopped parsley and a few cracks of black pepper. Everyone will be licking their bowls clean, I promise! How should I reheat this soup? You can either reheat it in the microwave or on the stovetop. Add a few splashes of broth, water, or milk to loosen it up before heating. In a large stockpot or dutch oven set over medium-low heat, add the butter. Once melted, add the celery and saute for 3 minutes, then add the carrot, shallot, and garlic. Saute for 2 minutes. Add the flour. Whisk the flour until it turns golden brown, taking care not to burn. Gradually pour in the chicken broth, whisking continuously until combined. Turn heat up to medium and bring to a simmer. Add the salt, garlic powder, pepper, coriander, paprika, and cayenne pepper. 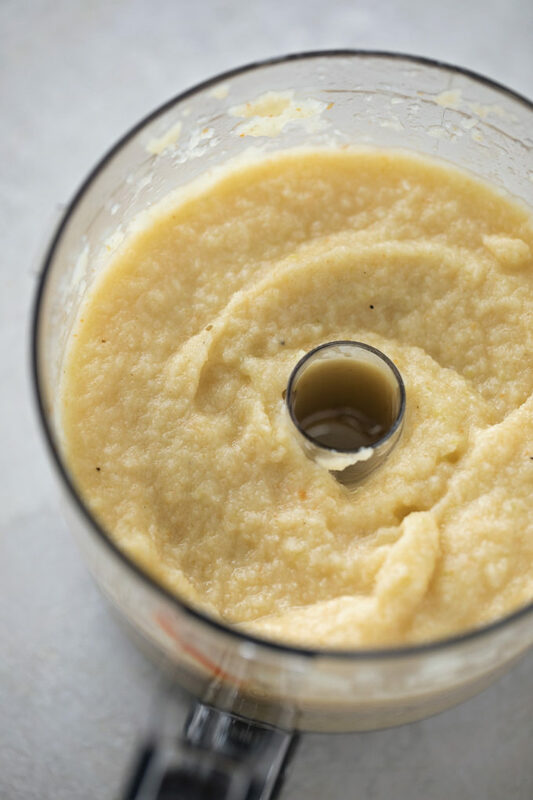 Add the cauliflower, allow the soup to gently boil for 15 minutes, then remove 2 cups and puree in a food processor or blender until smooth. Return the mixture to the soup. Pour in the cream and continue to gently boil for an additional 10 minutes, then add the cheese and whisk to combine. Remove from the heat and garnish individual servings with parsley, if desired. -You can make this soup silky smooth if you puree everything using a high speed blender (like a Vitamix or Blendtec) or an immersion blender. We personally prefer some small little chunks.